WARRIORS missed a number of chances to squander an opportunity to qualify for the 2019 Afcon finals after a 1-0 defeat away in Liberia yesterday. Zimbabwe went into the match looking for a draw to seal a place for Africa’s major football tournament to be hosted by Cameroon in June next year. The result means Sunday Chidzambwa’s men will have wait until March next year for their last home match Congo Brazzaville to confirm qualification. They still need a draw in that match. They, however, still remain top of Group G with eight points and a draw will be enough for them to qualify for the fourth time in the country’s history. Striker Tinotenda Kadewere, who was returning from injury, missed some glorious chances which could have earned Zimbabwe positive results. 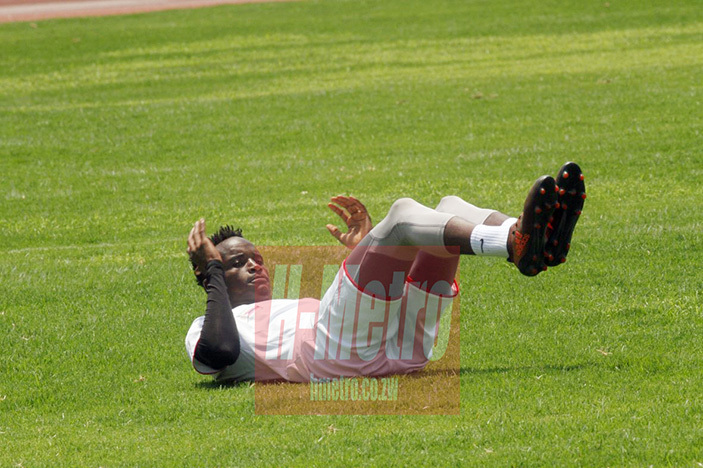 However, left back Ronald Pfumbidzai who set Kadewere inside the box in first half before the latter failed to curl home reckons it was not their day. “I think we tried to cope with the conditions. And I think everyone wanted to win but it wasn’t our day. “This game was an open game were both teams created chances. Unfortunately we ended up on the losing side. “Liberia managed to bury their chance,” he said. Pfumbidzai said the March game is a must win for them. “We should win this game at all costs. I think everyone knows what is required and we just have to impose our game plan from the start if we really want to win this game. “There is still hope for us to qualify and I am sure we will. “My word to the fans is that they shouldn’t lose hope. We know they were waiting to celebrate but it went the other way. “I want to urge them to keep supporting the nation until we qualify,” he said.